Market timing can be defined as making investment buy and sell decisions using a mechanical trading strategy which employs one or more indicators and/or proven strategies. The objective of a successful market-timing system is to be invested in the market during up trends and to be either in cash (or in a short position) during down trends, especially during brutal bear markets. 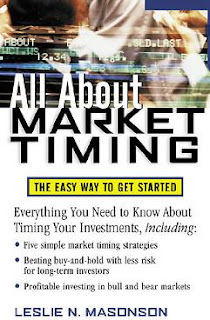 Market timing can be applied to all types of investments including stocks, stock and index options, mutual funds, bonds, and futures.This book therefore focuses exclusively on using timing with index funds, sector funds, leveraged funds, and exchange-traded funds. It is your choice as to which of these investments you prefer to work with because the timing principles remain the same for each of them.